Group process as an art. "Process Arts" refers to the field which includes all disciplines which study, design, and facilitate group process. 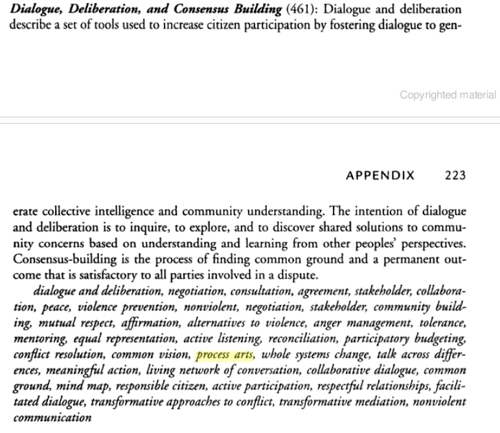 Though the term was coined by Brandon WilliamsCraig and released to the commons, the process arts are ancient, emergent in the contemporary era, and in development by colleagues all around the world using names like management, consulting, facilitation, dialogue and deliberation, marketing, community organizing, social action, and many more. In Blessed Unrest, Paul Hawken included the process arts but presented it inaccurately as a methodology rather than as the name for the field. Available to be produced or contracted at your location! for a list of upcoming East Coast programs, click here! This two-part module is an immersion in various modalities that facilitate greater awareness of how we each relate to the larger social sphere. In the first two weeks of Process Arts, the curriculum includes Process Work, Theatre of the Oppressed, Authentic Movement, and Voice. In these classes, we will look within our own bodyminds to discover a greater range of options in relating to diversity, conflict, and our rapidly changing culture. The two weeks also includes a social change project, homework and integration classes. The second two weeks of Professional Facilitation Training includes basics of facilitation training in the first week, followed by more advanced training in the second week. The first level will address skills for the beginner facilitator (The Basics of Group Facilitation with Paul DeLapa) and the second level (Going Deeper: Advanced Facilitation with Isoke Femi) will address skills to deal with edgier issues such as racism, sexism, and ableism. These two levels of training challenge participants to step into a conscious leadership role as a group facilitator. For students not taking the full module, there are several other options to engage in this curriculum. See the full list of workshops that can be taken independently listed under Socially Conscious Body. The Process Arts and Facilitation module integrates the "movements" of thinking, listening, and speaking with physical movement along with teaching specific Professional Facilitation Skills. Soaking in the many ways (historically and globally) in which people move in their lives and communities, this module adds an embodied perspective often yearned for in work that is more cognitive or taught from a more academically traditional model. By linking Process Work, Heart Circles, and Theatre of the Oppressed with Voice and Authentic Movement, this curriculum encourages us to look within our own bodies and minds to discover how we interact with diversity and conflict. In order to complement other modules in our curriculum, Module 2 has us inquire into the body by examining our interactions, differences, conflicts, unconscious life, body language, styles and unique signatures. This notion of beginning with awareness and observation is a commonality among somatic practices, interpersonal community building strategies, and expressive artistic methods. "Who am I? ... when I speak, when I move, when I feel ... and how does that affect the human and environmental tapestry in which I live?" The beautifully rich experience of observing is then allowed to blossom into ACTION. This is the step often absent from lecture based learning, whether analyzing historical and current phenomena or artistic and social processes. Once the multitude of wisdoms in an individual are called upon (physical, emotional, cognitive, spiritual), an intrinsic response into relationship can occur. This module seeks to cultivate attention on HOW choices happen and how the whole person is involved in making change happen. People now face the challenges of living in societies divided by psychological and physical borders, in which power dynamics are often foggy and overwhelming. We offer this curriculum as a doorway to a sense of empowerment, inner balance, deepened communication, understanding, and an integration of our reflective and expressive selves. Part Two of this module, Professional Facilitation Training, will further integrate our learning by challenging us to step into a conscious leadership role as facilitator. Learning specific tools in either the Basics or Advanced sessions will not only teach us how to run meetings in an organized fashion, but also how to fine tune our awareness to signals and interventions which speak to the underlying (and often ignored) dynamics in groups. Classes in games and songs for community building and a somatic approach of looking at ourselves psychologically (Tracking the Unconscious Facilitator) will build more awareness of how the body becomes a resource and tool to support us in the facilitative role. Participants in this two-part module will engage in Voice classes, Heart Circles, and Authentic Movement to help embody and anchor each week's intensives in Process Work, Theatre of the Oppressed, and the Facilitation Trainings, along with a community project in Social Action. Faculty advising will offer core students seeking certification additional opportunities to make the connections necessary to apply each modality in every area of their own developing work. As in each MOC module, we include Heart Circles and verbal check-ins as a way to foster group cohesion and assure that emotion, spirit and critical thinking are nurtured in individuals and as a collective body. Students are required to participate in study groups and do integrative homework assignments using themes from Participatory Arts. As in the other modules, there will be some mandatory reading, and occasional homework assignments for all students. An international process arts organization headquartered in the United States. Pages tagged with "Process Arts"